According to clich�, all actors really want to direct. 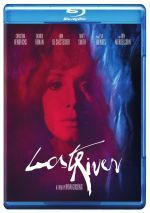 Add Ryan Gosling to this roster, as he goes behind the camera for 3014�s Lost River, his directorial debut. Single mother Billy (Christina Hendricks) lives in the dying, largely abandoned town of Lost River with her young adult son Bones (Iain De Caestecker) and toddler Franky (Landyn Stewart). Bones wants to leave but needs to raise money to do so. He strips old buildings of copper to sell, but he finds himself hampered in that regard by local gangster Bully (Matt Smith), a thug who runs roughshod over the area. Billy wants to stay where she is, but she runs into trouble when she gets behind on her mortgage. This threatens her ability to maintain her home. We follow the family�s struggles to survive as well as interpersonal relationships and twists connected to the nature of their town. As I noted at the start, Lost River marks Gosling�s directorial debut, and it also offers his first filmed script. Dare I say that Gosling bit off more than he could chew? Perhaps he should�ve chosen one job or the other. Maybe Director Gosling could�ve done well with someone else�s script, or Writer Gosling could�ve benefited from a different perspective on his screenplay. Left unfettered by the intervention of others, though, Gosling appears allowed to pursue all the self-indulgence he desires, and that results in a movie that seems laughable in its pretension. From start to finish, Gosling seems desperate to establish himself as an artiste. He wears his influences on his sleeve � with a particular nod toward David Lynch � as he creates a world that seems lurid and dysfunctional for its own sake. Matters take odd turns without a background that makes sense and the whole enterprise constantly threatens to run off the rails. The only reason the movie doesn�t totally go kerblooey is because it lacks any substance to start. Gosling appears to want to make a major �statement� with Lost River, but I�ll be damned if I can figure out what that �statement� might be � and I�m not sure Gosling knows, either. Lost River feels like Gosling and the actors made it up on the spot. That sense of looseness can work, but it doesn�t succeed here, as the movie just seems meandering and pointless. Characters lack substance and the story fails to become interesting in any way. Perhaps a more experienced, disciplined filmmaker could�ve done something with the tale. Beneath the surface, something intriguing lurks, as a story about a family that strives to remain in an abandoned, decrepit locale could deliver a worthwhile narrative. As a novice, though, Gosling can�t do much more than submit to his inner pretensions. He seems so eager to create a work of art that he forgets to give the movie a backbone and structure. Lost River does little more than test the viewer�s patience. Lost River appears in an aspect ratio of approximately 2.40:1 on this Blu-ray Disc. This became a good presentation. For the most part, sharpness seemed fine. A few shots came across as a little soft � usually during interiors � but most of the flick offered good delineation and detail. I noticed no signs of jagged edges or moir� effects, and edge haloes stayed absent. Print flaws created no concerns. Colors went down a stylized path, though they lacked a consistent trend. We got some heavy greens, purples and other tones along with more �standard� tints like teal. Within these choices, the hues appeared well-rendered. Blacks appeared deep and full, and low-light shots delivered positive smoothness. I felt pleased with the transfer. As for the film�s DTS-HD MA 5.1 soundtrack, it emphasized creepy atmosphere. Much of the audio took on a foreboding tone, though we also got basic effects to match outdoor settings, nightclubs and the like. These fleshed out the speakers in a reasonable manner, and music added involvement from the five channels as well. The quality of the audio seemed fine. Speech remained distinctive and concise, without edginess or other issues. Music showed nice range and heft, and effects were accurate and dynamic. Because of the track�s limited scope, it didn�t impress, but it suited the movie. The Blu-ray comes devoid of any extras. It doesn�t even include previews for other movies! Perhaps someday Ryan Gosling will turn into a good writer or director, but his debut fails to deliver a satisfying piece of work. Gosling creates a formless, pointless and self-indulgent movie that goes nowhere. The Blu-ray offers good picture and audio but lacks any supplements. I would�ve loved a commentary to hear Gosling attempt to justify this meandering dud.